PRODUCT DESCRIPTION (4.4/5)Trixie Fantasy Board is a treat toy feeder that gives your cat a challenging game to get its treats. 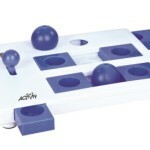 The board features 4 modules, each with a different level of challenge for your cat to play with. The game stimulates your cat’s brain and at the same time it gives your pet a fun activity while working for its treats. Trixie Fantasy Board stimulates your cat senses of smell and hearing because cats don’t see close objects in detail as humans, so this toy helps cats to use their senses just as they would do in the wild to catch hidden prey. Each game of Trixie Fantasy Board requires a different combination of the cat’s 5 senses. The Treasure Hunt bin can be filled with the provided ping pong balls to cover the hidden treats. Your cat has to work trying to get the treats from the bottom, swatting the balls out to reach the treasure. 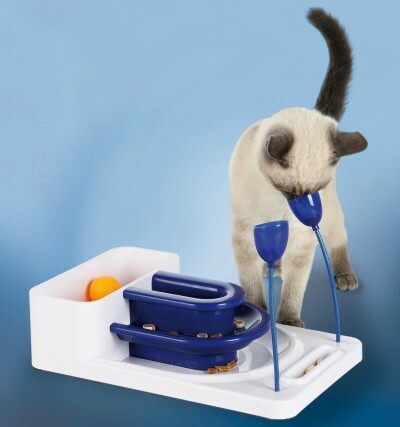 The Go Fish Fountain has 3 levels where you can place the treats for your cat to capture. 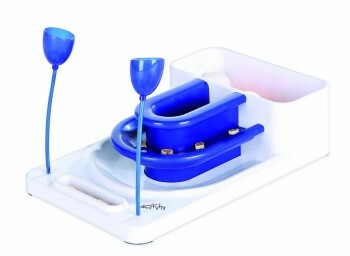 Cup Scoop is a little more challenging and it will require your cat to remove the treats from inside the cups scooping or bending the cup scoop over to let treats fall into the Alley module below. Alley allows your cat to comfortably lay down while poking and sliding treats over with their paws, claws or even toes if creative enough. Trixie includes an instructional booklet with different tricks and tips to keep your cat entertained and engaged, stimulating your pet mentally and physically. This cat treat toy dispenser is suitable for cats of all ages and activity levels. It comes in colors blue and white. Trixie Fantasy Board offers 4-in-1 games in one toy. You have to place the treats in all four modules for your cat to start having fun and playing. Try to do this in front of your cat so he or she sees where the treats are. The first one is “The Treasure Hunt bin”. As previously mentioned, you fill this bin with ping pong balls that come with the toy to hide the treats underneath. Your cats has to paw the balls out until reaching the treats and scoop them out. The Treasure Hunt bin stimulates your cat’s natural hunting instincts, recreating the situation of little preys hiding from where your cat has to hunt them. 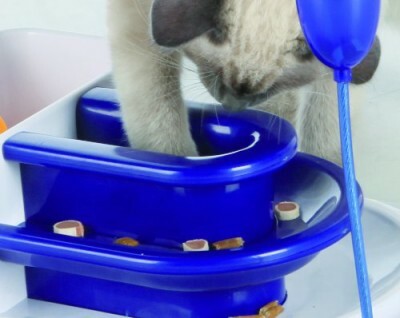 The Go Fish Fountain has 3 levels to put treats from where your cat has to scoop to eat them or make them fall to lower levels and keep trying to get them. The Cup Scoop acts as a “catapult” if your cat is smart enough to figure it out. This is the most challenging game of the board and it will take patience from your cat to get its treats from here. If tall and skilled enough your pet can scoop the treats directly from the cup and making them fall onto the floor or eating the treat from its paw. Alley gives your cat the instance to paw the treats over and eat them while laying down if feeling lazy. You can fill “Alley” module with paste, canned food or simply treats or dry food. It keeps cats busy and active working for their treats. It stimulates cats mentally in trying to figure the games out. Toy is well constructed, with good materials and good weight. 4-in-1 games that keep your cat interested. 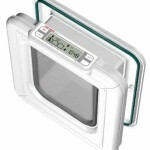 Modules are designed for your cat to scoop the treats and try to reach them, not pawing to get them easily. Balls that come with the board are themselves an extra toy. The horizon of entertainment is not very long once your cat has figured the games out. Ping pong balls fall over the floor when your cat is reaching its treats, not a big deal if you don’t mind looking for them. When cats bend Cup Scoop over, as catapult, some cats may fling treats all over the floor (this is a “con” only if you don’t like treats somewhere over the floor). You can put dry food in the toy to make your cat work for its meal. You can mix ping pong balls with toys to keep your cat entertained and to increase the level of difficulty a little bit. If you have a dog try to switch the ping pong balls for something safer for them to chew. Some cat owners put pieces of freeze-dried chicken in all the modules with very good results. Trixie Fantasy Board Toy is a well made interactive cat toy that works as advertised. In the beginning your cat will need a little help to figure some games out. This toy keeps cats interested and motivated to get their treats. The level of difficulty of this toy is basic so if your cat has never played with an interactive treat toy dispenser, this is a good start. However, you never know with cats, usually cats react in 3 ways with toys: they love it, they play with it but not very much or they won’t even bother trying it. 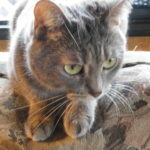 √ I recommend Trixie Fantasy Board toy for cats of all ages that like to work for their treats.